When unity is in Low graphics mode (because of software rendering) there are still window animations and fade effects which we should get rid of. On login unity should use opaque views (dash, switcher, launcher, shortcut-dialogs) with no fading and reduced effects. Windows should also use smaller shadows. Some settings from unity-control-center couldn't be applied to normal profile. Low graphics mode might be used as normal one. Accepted compiz into xenial-proposed. The package will build now and be available at https://launchpad.net/ubuntu/+source/compiz/1:0.9.12.2+16.04.20160705-0ubuntu1 in a few hours, and then in the -proposed repository. Accepted nux into xenial-proposed. The package will build now and be available at https://launchpad.net/ubuntu/+source/nux/4.0.8+16.04.20160705-0ubuntu1 in a few hours, and then in the -proposed repository. I tested it on my default install by enabling lowgfx through CCSM. It did switch off all transparency effects. Also there are no preview animations in Dash but I still have fade in and fade out animation for showing windows (Super+W). In my testing using virtual machine that animation was disabled so I guess it works as intended. Also in virtual machine I can't enable workspaces. I've forced the lowgfx setting with command from comment #9 and the fade in fade out animations are gone. But I can't change the launcher icons size. The slider in control center isn't working. Also The workspace switcher can't be enabled and it disapeared from launcher. I have it enabled in regular gfx. This is automatic when this is forced with upstart, otherwise you've to do it by hand. Changing launcher icons size works and workspaces also work without unneeded animations. Possibly as a result of this change, unity/compiz is failing to start when trying to install from the latest 16.04.1 daily ISO under qemu (xenial-desktop-amd64.iso 20160713, sha1sum c9b1ad9b1044c4e68684395daa3f85e016491c3a). 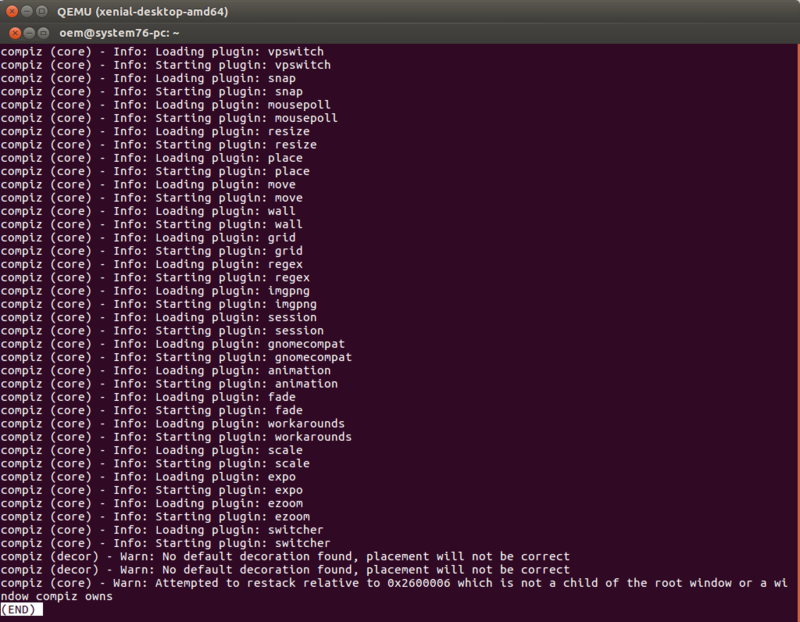 I attached a screenshot as I couldn't file a bug from within the qemu VM (apport doesn't seem able to launch firefox). Here's another screenshot that shows the SegvAnalysis. In my testing thus far, this failure (assuming it's related to this unity/nux change) only seems to happen when trying to install under qemu. I tried -vga qxl, -vga std, and -vga virtio... none of them yield a working installation. 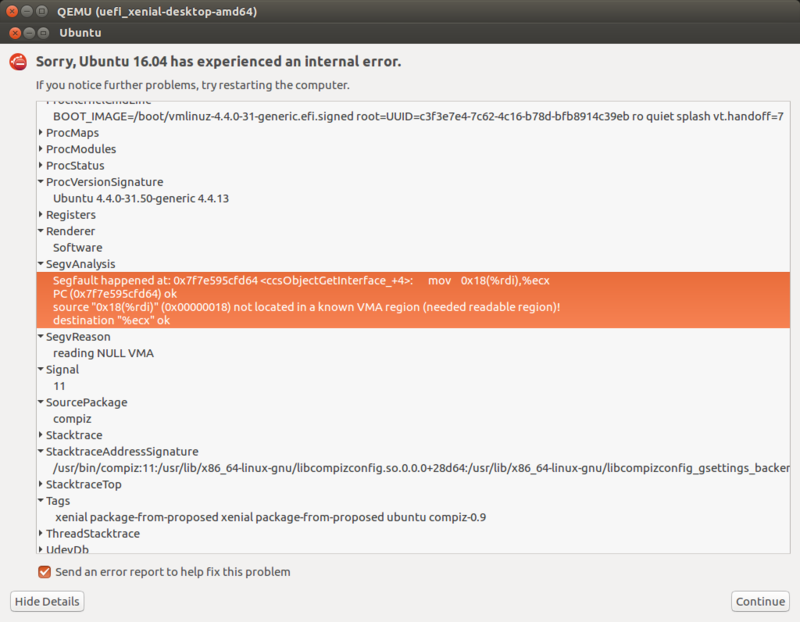 Compiz always fails to start. Jason, this is bug #1599900, already under our care. @Marco: thanks for the FYI! Marking as verification-needed since a new SRU version has to be landed to fix the crash mentioned above. Accepted compiz into xenial-proposed. The package will build now and be available at https://launchpad.net/ubuntu/+source/compiz/1:0.9.12.2+16.04.20160714-0ubuntu1 in a few hours, and then in the -proposed repository. Hi I'm not running in Low GFX mode but dash and switcher are opaque, how can I re enable transparency for dash and switcher? What profile are you running? Is lowgfx option enabled in your CCSM settings? Why does the GUI update-manager not update to the latest compiz package? I noticed the unity package updated and has unity7.conf which tries to use the compiz profile "unity-lowgfx" but it doesn't exist because compiz is still at version 20160526. sudo apt-get upgrade/dist-upgrade both detect and install the new compiz package but not update-manager. How to use gui сompiz settings? The Compiz Settings GUI is no such profile - unity-lowgfx (low-graphics in Ubuntu 16.04.1 x64). I have the same problem with ccsm, don't know why the lowgfx profile doesn't show but you can manually import it from /etc/compizconfig/unity-lowgfx.ini.